Capacity Planning helps the organisation identify the constraints in the development system, and also identify teams that are not working on strategic goals. From the organisations perspective, the most valuable work that the Credit and Payments teams could do is to help out the Windows and Mac Client teams, or perhaps Android or WinPhone Client. Any team or individual that moved to work on an unfamiliar area of the code would likely compare unfavourably to the teams/individuals already working on that code. 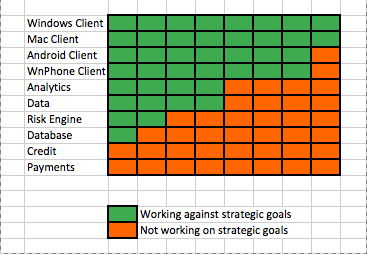 A team from Credit might only be 30% effective compared to the existing Windows Client team. Any HR performance / incentives scheme that compares or ranks individuals or teams against each other will discourage the Credit Team from working alongside the Windows Client team. They will find valid reasons for not making the move. The organisation will find it hard to encourage staff liquidity. They should have a policy that encourages people to work on the right work instead. A policy that encourages collaboration. Lets put that in simple terms. Any HR performance / incentive scheme that compares or ranks individuals or teams against each other is in direct conflict with achieving the goals of the organisation. Recently Microsoft famously gave up stack ranking. Sadly, other organisations have not seen the light and are happy for the HR department to wage a cold war against the organisation they claim to serve. This entry was posted on Sunday, February 23rd, 2014 at 9:11 am	and posted in Uncategorized. You can follow any responses to this entry through the RSS 2.0 feed. « Scaling Agile to the Enterprise – Step 1.